The majority of people who have a garden will also have a shed. The great thing about a garden shed is that it can be used for outdoor shelter or as a safe place to store tools, lawnmowers, and any other gardening equipment. The only problem with having a garden shed is that if you don’t maintain it and keep it in a good condition, it can turn into a dumping ground and become neglected and damaged by the weather. In order to keep your garden looking nice throughout the summer it is important to pay some attention to your garden shed. A dirty and worn shed that is covered in cobwebs and full of waste can often distract from the rest of the garden and put any other gardening efforts to waste. It’s definitely worth putting in some time and effort to revive your garden shed, but that doesn’t mean it needs to cost you a fortune, you just need to make a few changes here and there, and give your shed some TLC. 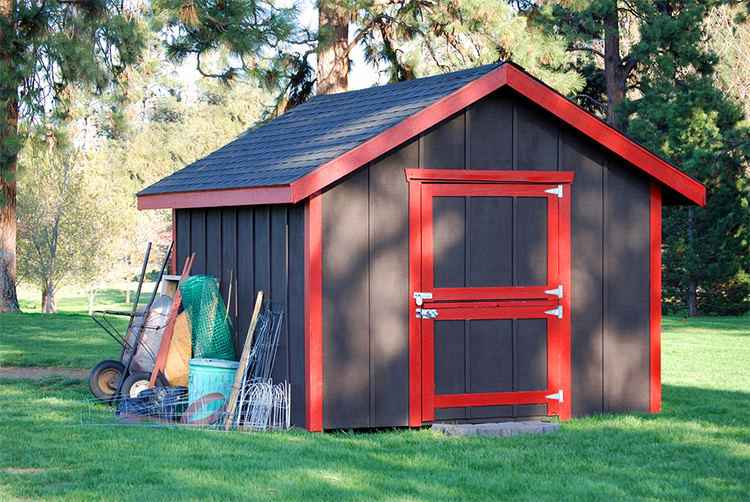 The first step to reviving your garden shed is to clean it out. Obviously you don’t want to throw away everything, so try and arrange the contents of your shed into three piles: hardly used, occasionally used, and regularly used. Throw away anything you find that is broken and can no longer be used, then repack your shed using your three piles. Put the hardly used pile neatly in the back of the shed, and the regularly used things at the front – this way you will be able to find what you are looking for next time you need one of your tools. Before you get round to repacking your shed, try and make it as organised as possible. The easiest way to do this is by installing some storage and shelving on the floor and walls of your shed. Old cabinets and drawers are ideal for storage, and just putting up some hooks can make a huge difference. If you have a lot of tall items such as canes, rakes, hoes, etc., then suspend a rope horizontally across the wall which will hold them in place and stop them falling over. A lick of paint can make a world of difference to your garden shed, and give it a whole new lease of life. The majority of sheds are made from wood, and this can unfortunately become warped and weakened when exposed to the British weather. Apply a pre-treatment to your wood or use a paint that contains a wood preservative. If your wood is already painted, then strip it back with a sander before re-painting, and don’t be scared to use a bright colour when you get round to re-doing it. Once the inside of the shed is sorted and it’s got a fresh new coat of paint, it’s time to give it some final touches and decorate. A shed doesn’t have to be plain and boring, there are lots of ways to jazz it up. You could attach a trellis to one side of your shed and allow climbers to grow up it, or just place some potted plants on the ground at the front. If you want to give your shed a summer house feel, then you could also put up some curtains on the windows and bunting around the roof. Once your shed is exactly how you want it to be, it’s important to keep it secure. Garden furniture and equipment isn’t cheap, so you need to keep it protected. Nail down any loose felt on the roof, and install a secure lock on the door. Don’t worry about going over the top with a lock - a couple of padlocks should do the trick. It’s important to keep your equipment safe, while also putting your mind at rest. Reviving your shed will make your garden stand out and put a new spring in your step this summer.